Do you remember your first dog love? Can you recall that first feeling of unconditional affection and devotion? Luckily it is a love that never leaves you. Last weekend these memories and emotions came flooding back as I met a reincarnation of my childhood dog, Defor (pictured above with my younger brothers). I was about eight years old when our neighbour’s Corgi gave birth to a litter of puppies she had conceived with some type of Jack Russell cross. Defor chose me and we went on many adventures together. Defor chased the mean boys on their bikes. And he always found a way to escape from home and follow us to school. He became a school fixture and when I graduated to high school he kept returning to my primary school and was even the subject of many art classes. Defor kept me company when I was lonely and consoled me through some devastating primary school clashes. Unfortunately the weekend of his death was also the weekend when my childhood innocence departed and as such he remains a lasting emblem of the simplicity and naivety of youth. So you can imagine my delight when Scooby sprang into our lives last weekend. Scooby was an abandoned dog rescued by a friend of ours. He is believed to be a cross between a Jack Russell and a Deerhound. However, to me he is more like a long-legged Defor. Like Defor, Scooby is a friendly and affectionate dog. Scooby gives and receives lots of joy from cuddling humans. He is also super clever and energetic. His favourite game is Zoomies – a self taught game of zooming around in circles so that he can’t be caught. To me, Scooby was a poignant reminder of the tenderness of childhood loves. He is a lasting legacy of the joy our doggy friends provide and the affection they bring throughout our lives. Book an appointment with the dog groomer early. Schedules will fill quickly as will the vacuum cleaner unless your faithful companion makes a quick trip to the hairdresser. An early trip to the dog groomer will keep them cool and the shedding under control. Also keep up the dog brushing in between grooming appointments. This will allow more bonding time between you and your hound and also minimise hair clean-ups. Make sure you have a large water bowl which is topped up with fresh water everyday. We’ve noticed our dogs are already drinking much more than usual as they try to deal with the unexpected heat. Take advantage of the longer days and get your dog walks in (and steps up) before the day gets too hot. 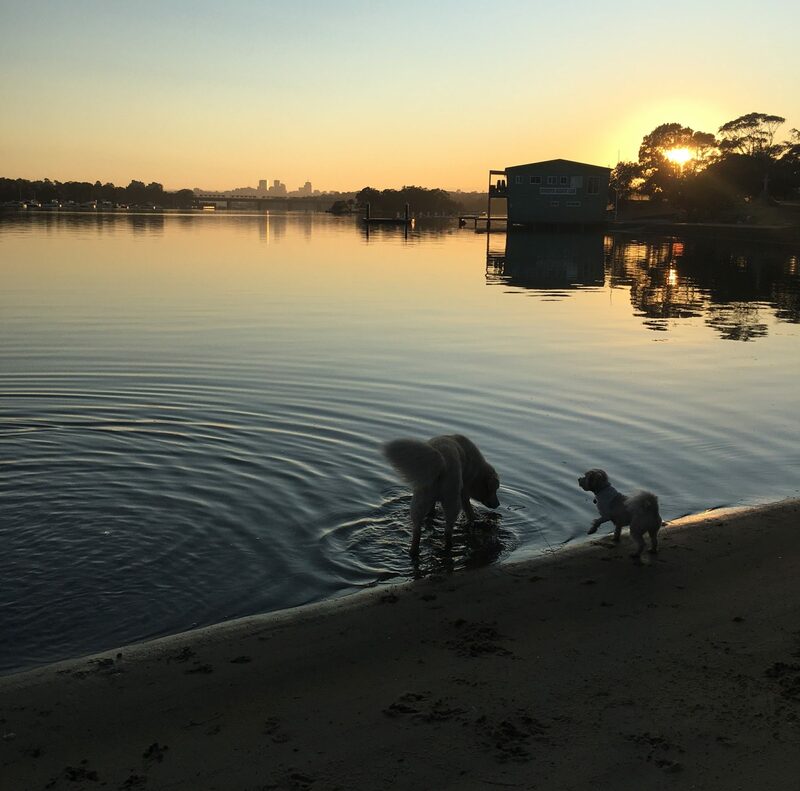 Daylight saving also starts on the weekend (Sunday, Oct 1) which is the perfect excuse to enjoy the sunset with your pup. Spring also means more ticks and fleas. Ensure your flea and tick treatments are up to date and key an eye out for signs of infestation. There are three types of ticks in Australia: Bush, Brown and Paralysis Ticks. The single most dangerous parasite for dogs is the Paralysis Tick. If you find a tick, remove it immediately and take your dog to the vet as soon as possible. Now is a good time to spring clean your dog bedding, toys, collars and leashes. A good clean up will make them more comfortable and minimise odours that can emerge with the warmer weather. Meet Rocket and Molly they share the same birthday and home. Rocket is a Golden Retriever and is almost eight years old. He is like a big friendly giant and even though the little kids are scared of him at first, they grow to find that he will do anything for cuddles, sleep and food. However, he is scared of stairs and hates being in the car. Molly is nearly three and is a hyperactive Maltese Poodle who loves snuggling and somehow lying in the most awkward positions on the bed and playing with soft toys and slippers. The two of them make the perfect matching set and they spend the majority of there time either snuggling up together, going on walks, or with Molly begging Rocket to play with her.